We slept in a little, got up and made breakfast for all of us. That's the great thing about airbnb's, they usually cut down the cost on eating out significantly. I don't remember what exactly happened in the picture below, but I know Finn was mad about something and Jake sat next to him and tried talking him out of it. This will be the first day on the trip without driving! Day 4 started with a short walk up near the Citadel (our airbnb was in an amazing location just a block away from the Citadel). You can see the amazing Frontenac Hotel in the background in the picture below. 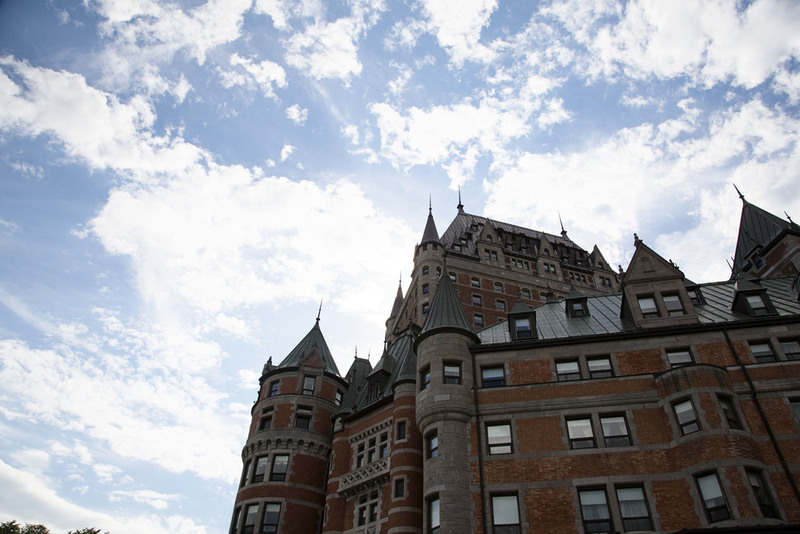 From up there we had an amazing view over Old Quebec and the St. Lawrence River. Can you guess what is happening in the two pictures below? Answer will be at the end of the post. 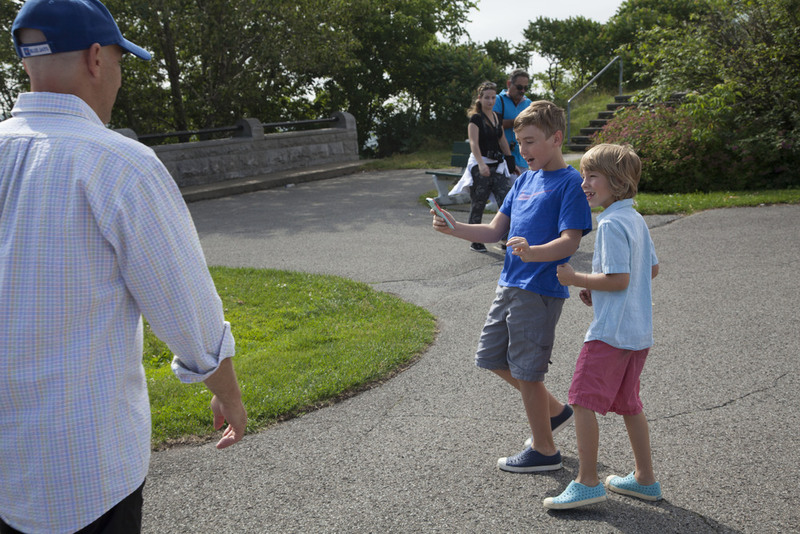 The boys decided to run down the hill instead of taking the steps. We took our time walking through the city. Stopping a lot and taking it all in. I love this picture of Jake below. 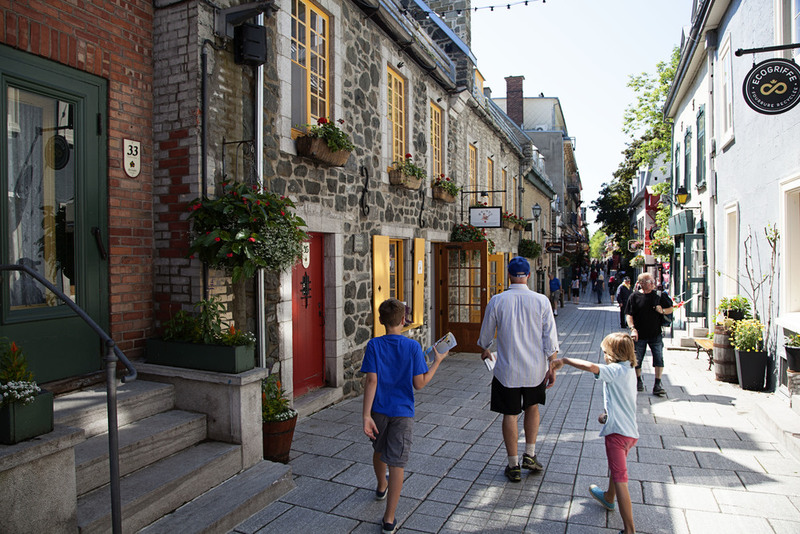 We walked down into the lower part of Old Quebec (mommy got a ride back up with the incline and the boys had to walk up the steps haha), we bought a few postcards for friends and family and started our quest to hunt for a souvenir for Jake. 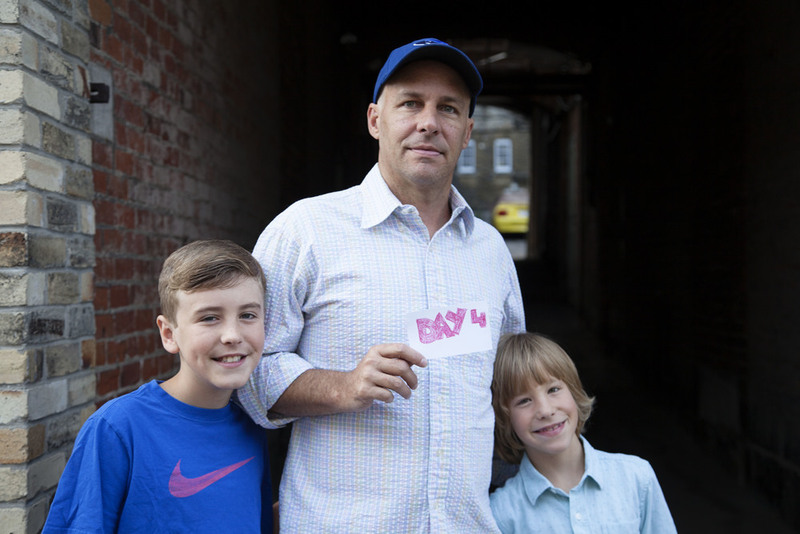 He got $20 from his Oma and wanted to buy one of the following: an umbrella, sunglasses or a zippo lighter. The zippo lighter was a NO from us and still not sure why he decided an umbrella or sunglasses would be a great souvenir. We never found anything on this trip he really wanted and he came home with the $20. 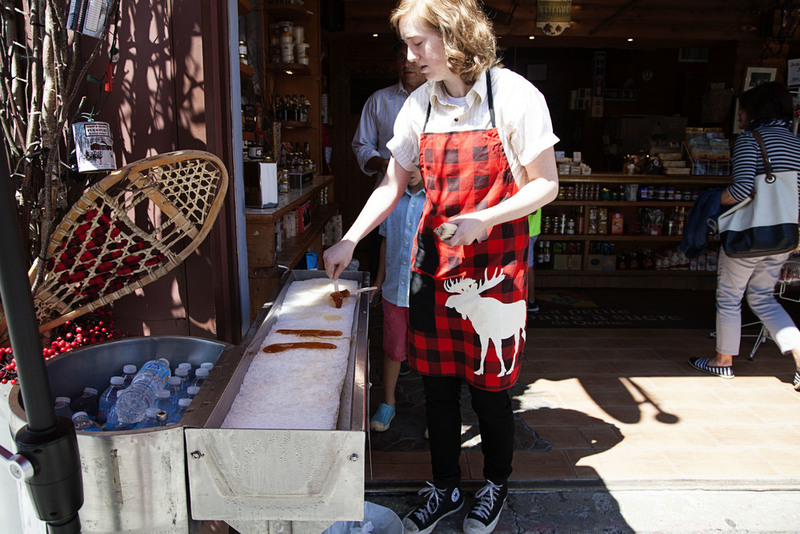 We watched how they made maple taffy and bought two to split between us. Glad we didn't buy more, because the kids both didn't like it. Half of mine ended in my hair... yeah which wasn't the easiest to get back out. We decided to give the "Lapin Saute" a try. "The Running Rabbit" I... you guessed it, a restaurant offering rabbit meat. The food was amazing and we all loved what we got. Finn got the pasta from the kids menu that came with cookies (in little bunny shapes) and chocolate milk. Jake had the poutine with rabbit. He really loved the poutine but was more into Scot's French Onion Soup, which was all of our favorite. I enjoyed a Rabbit Pate, that was really good and a small side of potatoes. After lunch we walked around for a little longer. We ended up on the Plaza of the Frontenac where street performers are performing all day. It is really fun watching them as they are hilarious. This particulat street performer pulled me out and just made me jump up and down... that's it... only up and down and it was actually hilarious. I was very happy that the above picture wasn't with Finn or Jake because he washed the kids hands with water from his mouth... haha it was funny but all I could think was that I hope the parents have hand sanitizer with them. 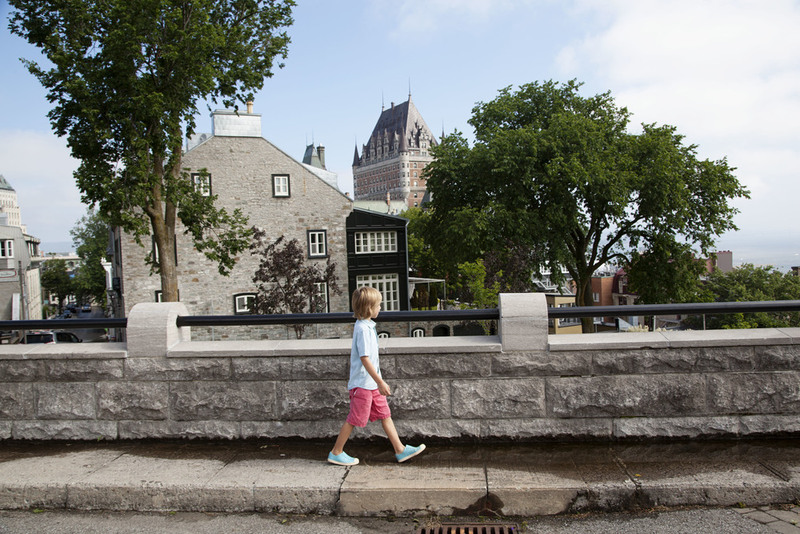 Quebec is just gorgeous and the boys really didn't complain at all walking so much around. Above they are cooling off in the fountain for horses! Finn decided that he will roll down the hill from the fortress wall and was upset with ME because he got dirty from it. He later washed himself off in a fountain and was back to being happy again. I have a feeling these cannons have something to do with his change in mood. Jake and Finn both loved playing with them and pretending they are protecting the city from the British. We all loved listening to the musical spoon instruments and the boys got to try them too. It was pretty cool and Jake thought about spending his $20 towards one of them but we then realized that the cheapest spoons were over $45. Yikes! We all got to touch the famous "cannon ball" in the tree. Later in the evening, Scot and Finn decided to go back to the music festival and listen to some concerts. Jake and I are really not that into big crowds and preferred to see a few more street performers. I remembered seeing this couple 3 years ago with Scot in Quebec and they are really great. The performer jumped through this hoop on fire with knives. I was really glad Finn wasn't with us and got any ideas. Jake and I strolled around the Frontenac for a little bit and watched the sunset. Came home and met up with the other two at our Airbnb. The picture below is the entrance to the courtyard we had to drive through with our car. Day 4 was great but we all couldn't wait for Day 5! ANSWER! the boys caught their first Pokémon on Pokémon Go. 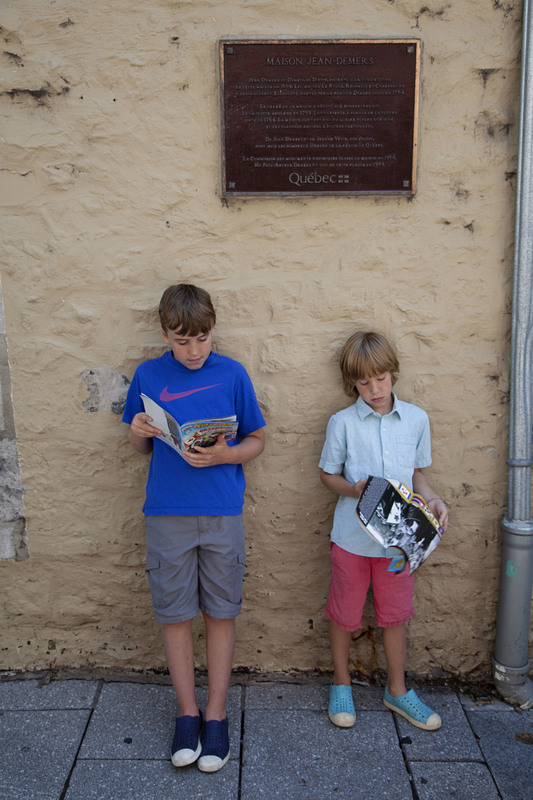 They mainly walked around all over Quebec without whining because of Pokémon Go!!! I would call that a win - win!